Everybody has a skin problem to tell. I have extremely oily skin, I have had years of blackheads and whiteheads, and if anything, I have bouts of acne more unpredictable than the weather. And I think a lot of the girls in the Philippines also have the same problems. But some have it worse-- some have eczema, some have skin asthma, and some people just have extremely sensitive skin. We go on with our lives not realizing that our skin problems have been holding us back in one way or another. For some, it can be feeling discomfort or pain that daily activities aren't so easy to do, or for the others, bad skin can take a toll on the self-esteem. 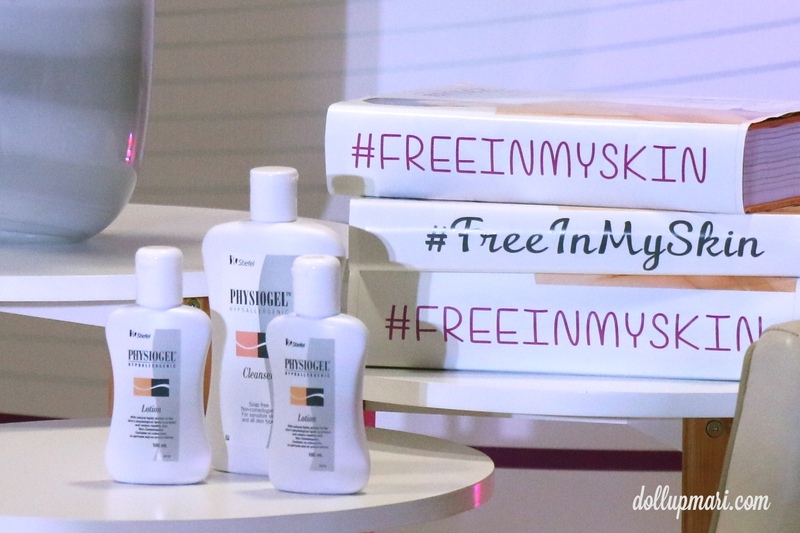 For those women who have gotten over their insecurities, for those women who are living their lives to the fullest, and for those women who are being the best version of themselves, Physiogel wants to honor them with the launch of the #FreeInMySkin movement. The movement is all about leaping at life's opportunities without having to be held back by dry and sensitive skin, empowering the inspiring women in our lives, and of course, honoring the women who are free in their skin. The event was held last September 9 in Makati Shangri-La hotel. 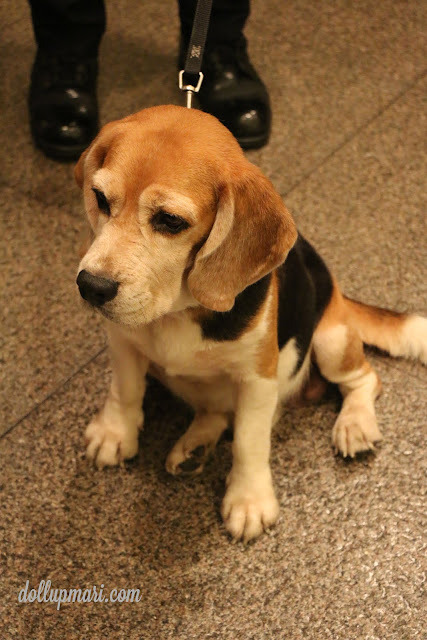 And yes, I am absolutely in love with the security beagles they have in the entrance. This is Buchi being his cute self. This is the outside of the Isabela ballroom. 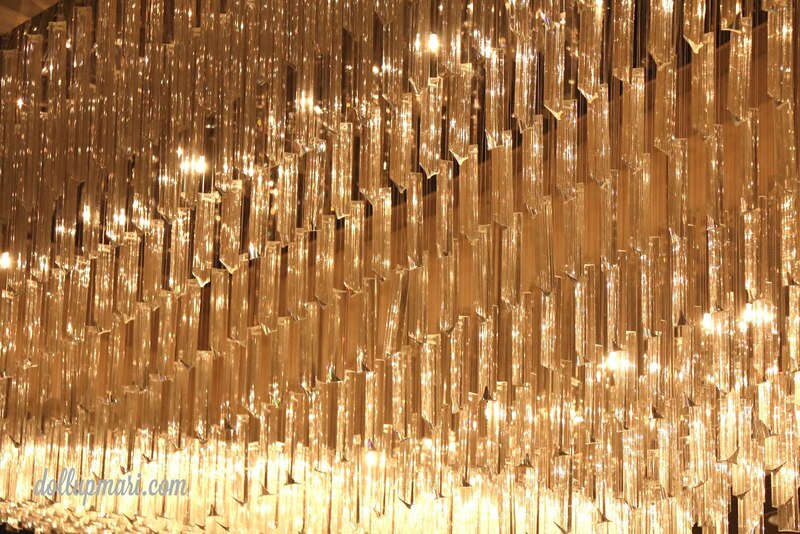 I'm sorry wherever I go I just have to take photos of the chandelier. My bad. 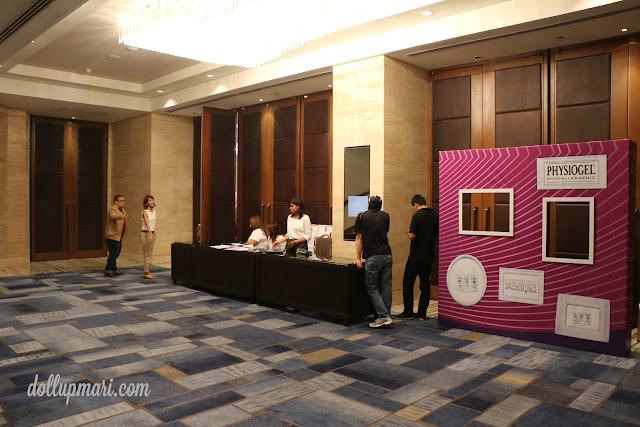 Inside the ballroom are members of the press, members of Glaxo Smith Kline, members of First Tier advertising, and fellow bloggers like me. The event was hosted by the lovely Patty Laurel-Filart, who, by the way, looks so gorgeous in her dress. 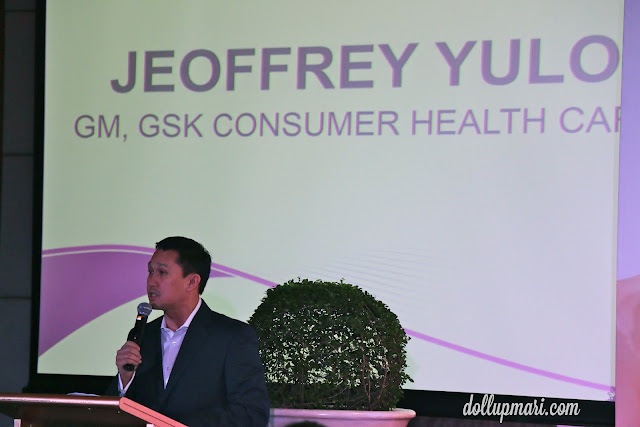 Mr. Jeoffrey Yulo, the general manager of Glaxo Smith Kine Comsumer Healthcare, gave a short speech to start off the evening. In his words, GSK is committed to improve the quality of human life by enabling people to do more, feel better and live longer. 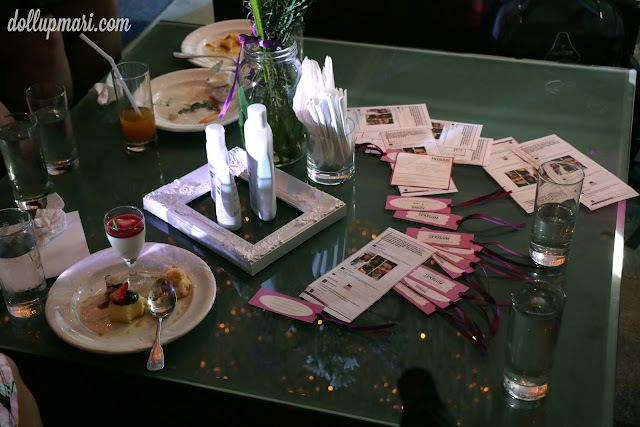 On the tables were samples of the products for guests to try as well as sample entries of #FreeInMySkin posts and some Physiogel bookmarks. The star of the evening is Patti Grandidge, the face of the campaign. 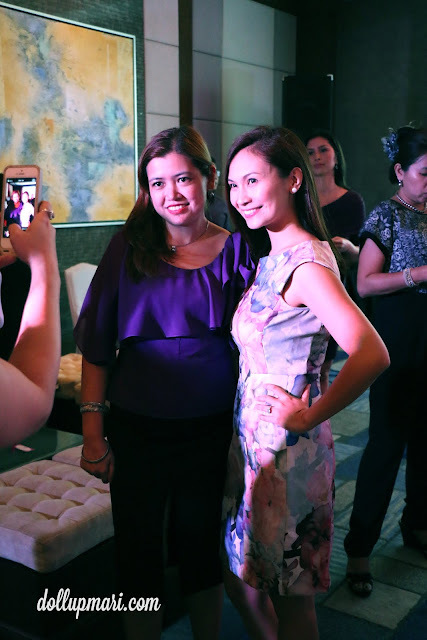 You may know her as a model (the pretty face you see in EDSA's billboards), TV host (of ETC's etcetera), and an entrepreneur. I think she's a fitting choice because she looks exactly as fresh as she is in her ads-- you would kind of think that the ads must be showered with photoshop, but in her case, you know the ads have minimal to no retouching because she looks so stunning in real life. She shares that since she traveled a lot in her younger days, the different climates and conditions of all the places she visited kind of took a toll on her skin, making it sensitive and dry. Of course, this is not helping if you are working in an industry where first impressions matter. 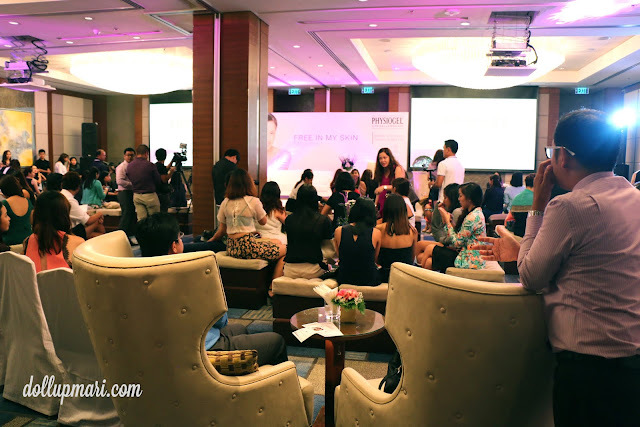 She also shared that she used Physiogel for about three to four months to see the difference, and indeed, she feels that her skin is much softer and healthier than before. Even her husband is a fan of the products now. She believes that one of the best feelings in the world is when you know that you're confident and in control of you life, and that Physiogel has been instrumental in making her feel free in her skin to do just about anything. 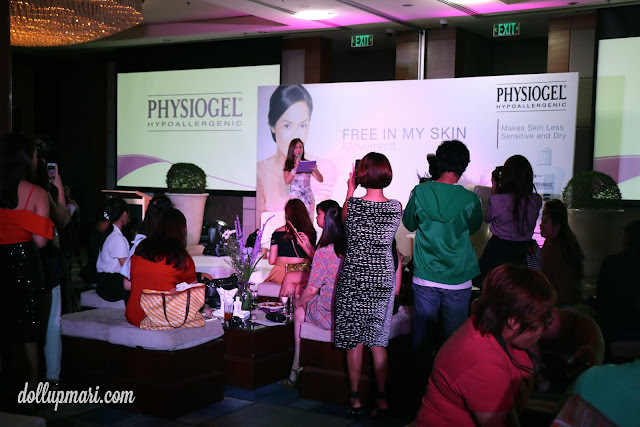 She now wants to pay it forward by inspiring other women to use Physiogel and to be free, too, from their own skin problems. Here are the other beautiful Physiogel ladies, Karima (in the blue dress) and Mica (in the purple dress). I kid you not, but Karima is 41. Karima is a dentist and she shares that in her profession, it's also about making people look good (with better teeth) that it's important to feel confident in your own skin. That's what Physiogel is for. (I think you can see the effects because look at how moist and dewy her skin looks). The other beauty, Mica, used to be full time in advertising and juggled all sorts of sideline jobs. She is also a makeup artist, and in makeup, I can relate that people look at you and assume that that's how they'll look once you're done dolling them up. It's important to have healthy looking skin to convince your potential clients that you are indeed an advocate of beauty. That's also where Physiogel comes in to save the day. The key people of the event pose for a photo. 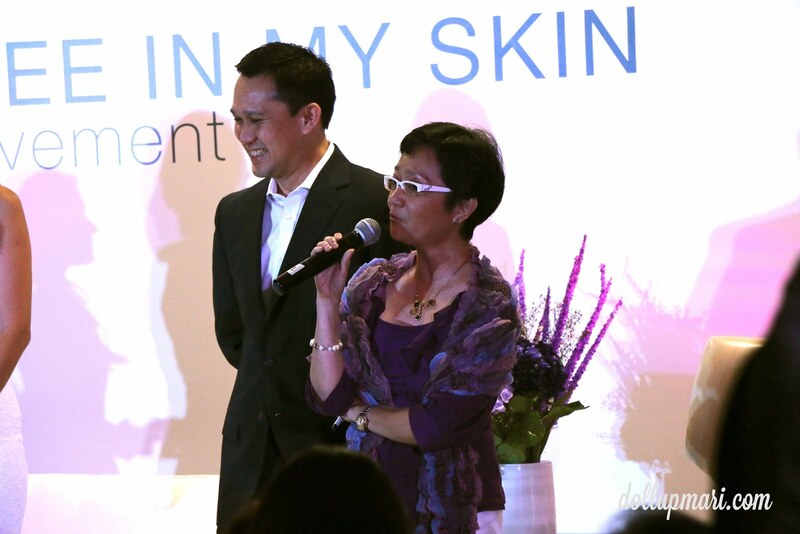 The lady with a shawl is Dr. Bernadette Arcilla, GSK's medical director. 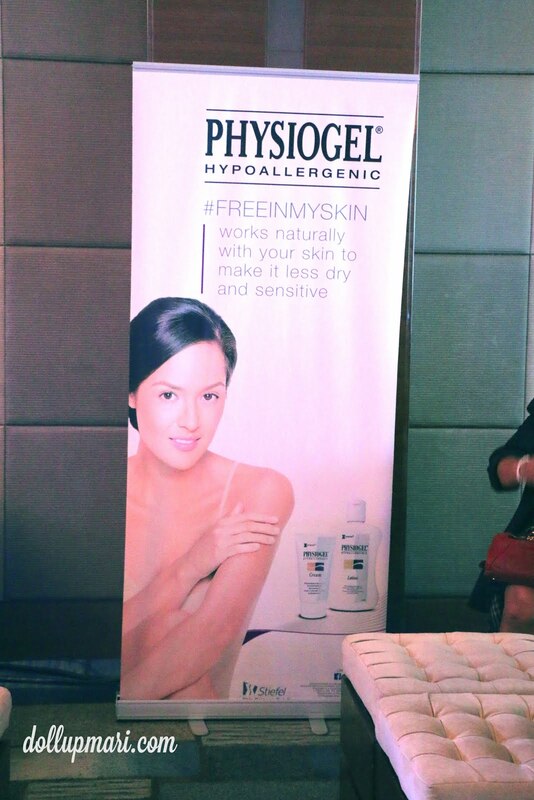 She's been a huge fan of Physiogel since its Philippine introduction 15 years ago. 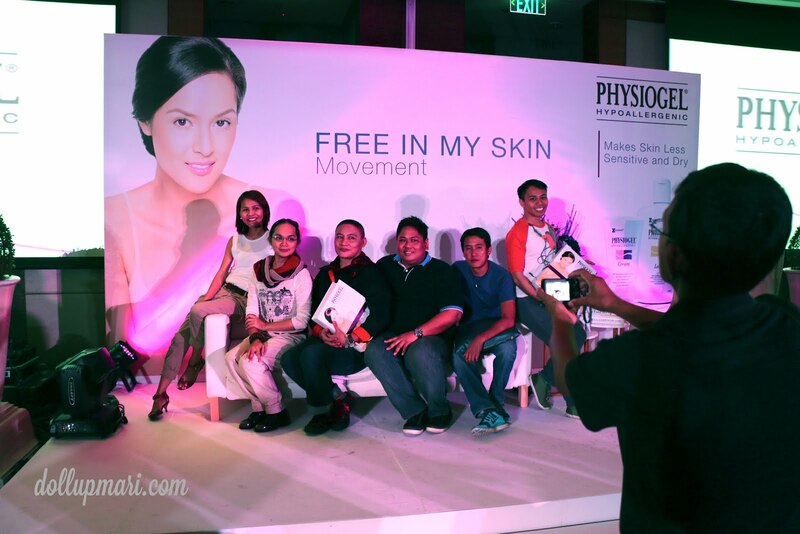 To end the event, the formal launch of #FreeInMySkin was embodied. Women in the room were given stickers with three blanks so that they could honor the smart, sensitive, and lovely women in their lives. After writing on the stickers, they placed them on this freedom wall. 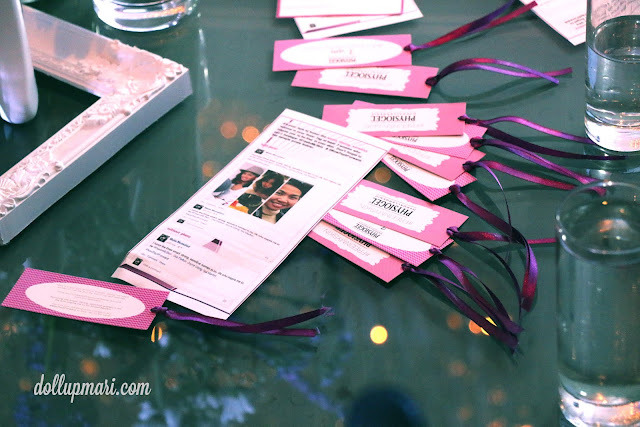 At the same time, the guests also filled social media with selfies of themselves or photos of the valuable women in their lives, and put in the hashtags #FreeInMySkin and #NowPayItForward. I really wanted to post on this wall, but the stickers ran out already (huhuhuhu), so I put my post in social media instead. No, I did not airbrush this photo. 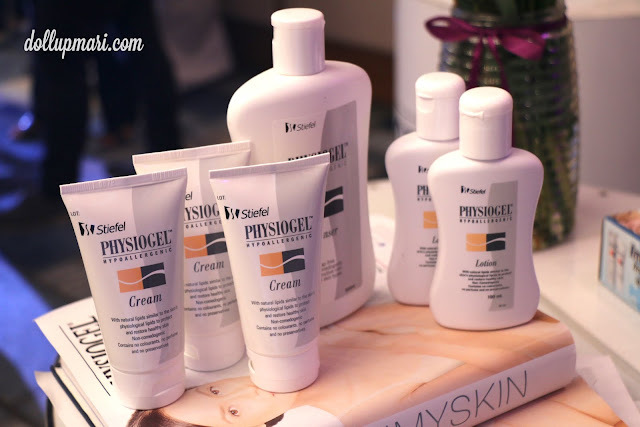 That's just how creamy Patti's skin really is (thanks, Physiogel!). 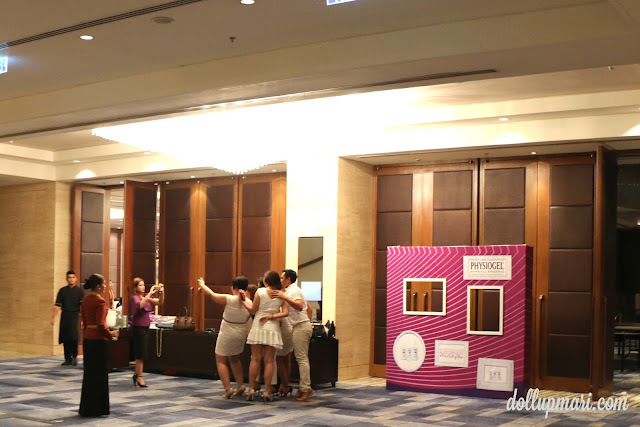 After the formal launch of the movement, they gave time for members of the media to conduct their interviews and take additional photos for their respective publications. Here's Mao of whoisthewriter.wordpress.com (and a member of the Inquirer) conducting an interview. Members of the PR agency now feeling fab and inspired by Patti that they had their own mini photoshoot. 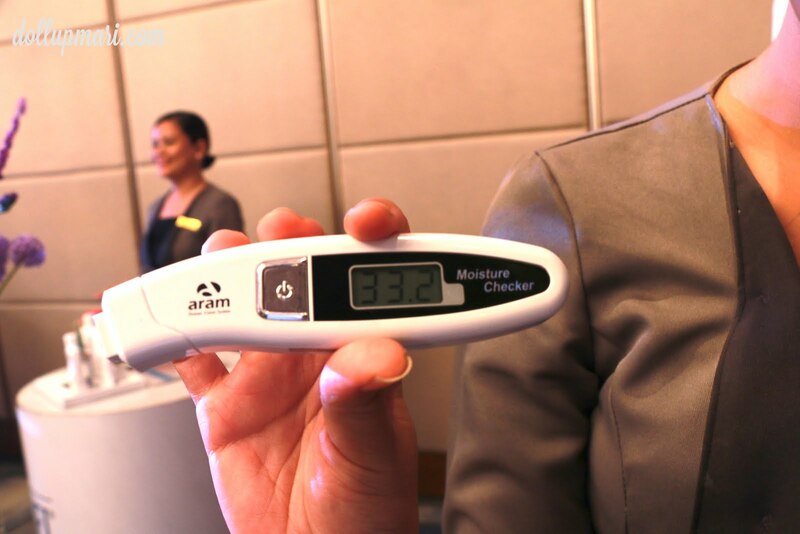 To quantify their claims, they had these gadgets in the event. 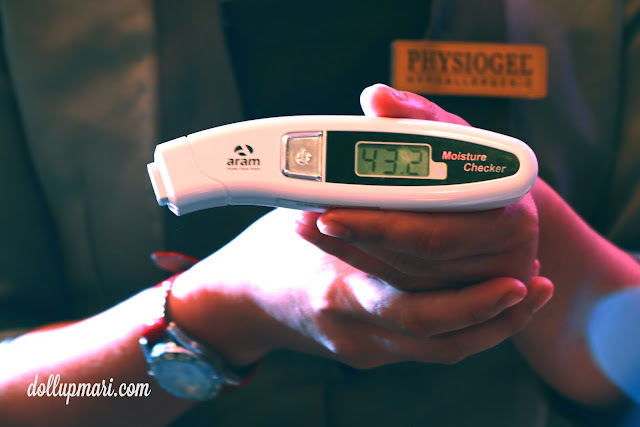 These gadgets are for measuring moisture content in the skin. In this scale, your skin is not moist enough when the reading is 40 and below. Knowing my extremely flaky and dry hands, I already expected a low reading, as shown by the 33.2 I got before using Physiogel. After using Physiogel's cleanser and lotion, my skin's moisture content immediately went up to 43.2, and stayed moist even the next day. I was positively surprised because my hands are usually so dry that I can barely keep them moist for more than a day. 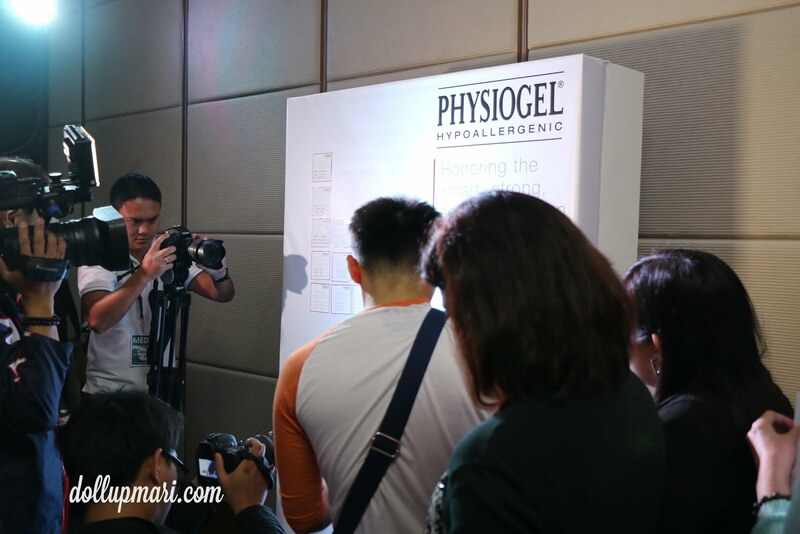 Actually, this whole movement is more than just some marketing scheme because Physiogel really delivers results. 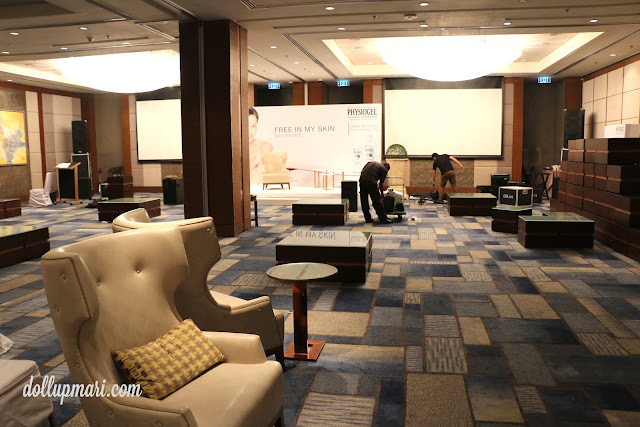 In fact, for the longest time, the brand had been known as a medical niche brand recommended to patients with problematic skin because doctors know that this is a brand that gets its pom poms together and gets things done. I was so thankful when I got to the event because I was already so hungry when I got there. 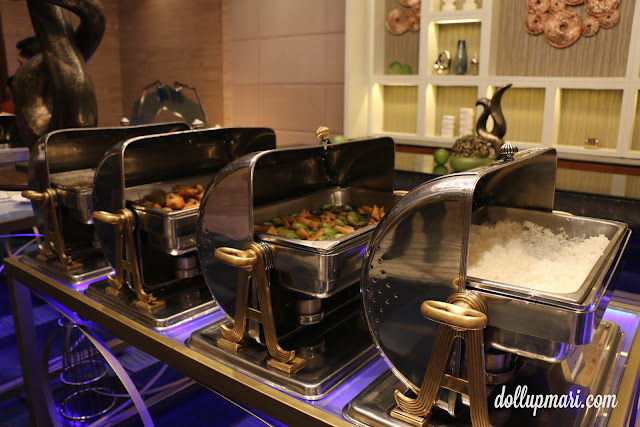 Thank you, buffet food. 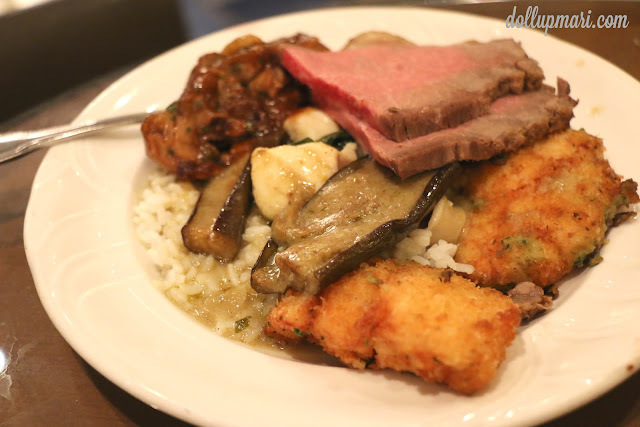 I especially loved the sirloin and the curry. 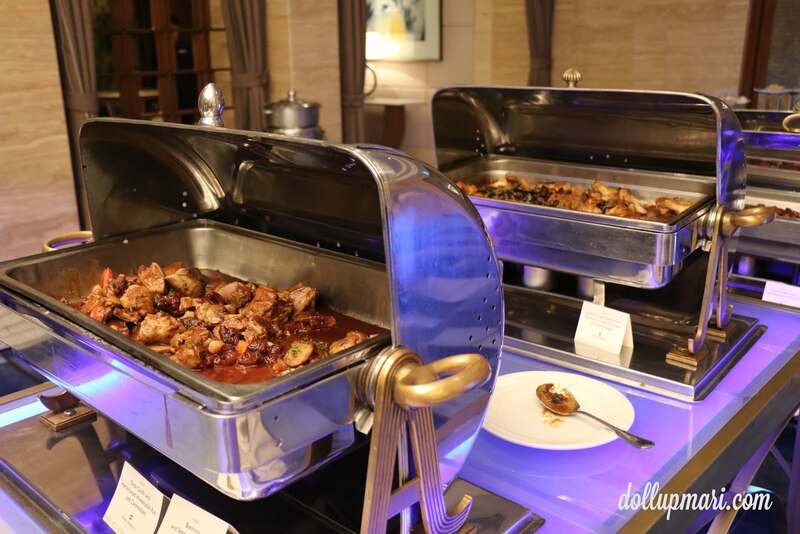 I hope I can do curries like this in the near future. After the event, the staff of GSK take a selfie for a job well done and a successful event. The #FreeInMySkin movement is most definitely not just for those who attended this event, but for everyone. If you have special women in your life that you want to honor, I urge you to join the movement.